Creating a positive experience for your website visitors is one of the ways to boost sales during the holiday shopping fever. Advanced planning as well as nice website decorations will ensure that your visitors feel happy and satisfied while making purchases in your online store. ComScore stats show that online spending grows each year and thus it is important to be well-prepared for the coming Holiday season. Deals continue to be the driving motivation for holiday shoppers. Sales and discounts were listed as the most important factor influencing their decision to shop at a particular retailer during the holidays by 74.7% of shoppers. Quality of merchandise was listed as most important by 60.9% of shoppers. Therefore when running the promotional campaign you need not only to have all merchandises ready to be shipped right away but also have your customer support team equipped with the right customer support tools and ready to handle the holiday load. It is important that your website can handle extra traffic and does not crash from extra load. Ensure that all services work fine and your visitors do not experience any issues while browsing your online shop. Not only your website but also your customer support team will have to handle extra load, so you need to have all your staff online to assist your customers in live chat, by emails, phone and in social media networks. 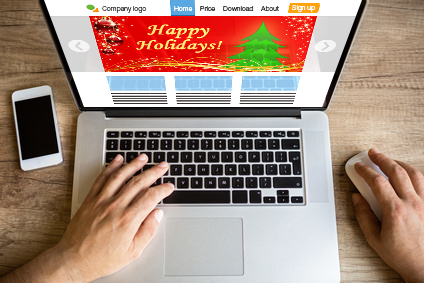 The right decoration of your website will let your shoppers get into the holiday spirit faster and will stimulate shopping in your online store. Besides uploading holiday website header, you can also add holiday-themed live chat icons and upload holiday logo to your chat messenger. Proper design and graphics will help tie your campaigns together and keep things consistent. From your promotional banners on your website and social media channels your visitors will quicker understand your promotion and start the purchasing process. Holiday discounts and marketing campaign will attract more visitors to your website and thus your customer support team should be ready to handle not only extra load but provide extraordinary customer service to ensure that those visitors who once came because of discounts or promos would come again and again in the future for repeating purchases. Adding a live chat tool on all website pages will let your visitors quickly get in touch in case they have questions. You can also send proactive chat invitations on checkout pages with ‘thank you’ message and suggestion to assist. Offering different customer support options does not mean that your visitors will not go to competitors if they do not find whatever they need. To avoid this you need to make your website navigation easy and simple. In addition to this it is important to have a mobile friendly website design as today more and more shoppers use mobile devices for making purchases. Online shoppers worry about safety of their shopping process and online payments. So it is important to let your customers easily find information about your security certificates and policy. For your live chat sessions you can enable secure connection to show that it is secure to share sensitive information and that you protect your customers’ data. It’s quite easy to win more customers if you prepare your website for the holiday season and offer your visitors superior customer experience along with generous promotions. With a little extra effort and thorough holiday strategy planning you will notice considerable pay-off and win more customers. We at Provide Support decorate our website for every holiday with special headers and live chat icons. Do you have any special tips which you use for your website? Feel free to share them with our blog readers! This entry was posted in Articles, Best Practice and tagged holiday decoration, holiday design, prepare website to the holiday. Bookmark the permalink.